The Canon EOS 1D Mark IV offers advanced photographic and video imaging possibilities for demanding professionals. Boasting a 16.1 megapixel APS-H sized sensor, Dual DIGIC 4 Image Processors, and a completely redesigned 45-point AF system, the 1D Mark IV builds upon the success of the legendary 1D series with expanded ISO performance (up to ISO 102,400), HD video recording, and 10 frames per second continuous shooting. The EOS-1D Mark IV has a newly developed, high-precision Area AF sensor with 45 manually selectable points including 39 cross-type, high-precision AF points for exacting and fast focusing no matter the subject. New AI Servo II AF focus tracking features improved algorithms that help improve stability, reliability and focus no matter the situation. Whether shooting a fast-paced soccer game or shooting a close-up of a bee on a wind-blown flower during macro photography, AI Servo II AF helps ensure sharp focus every time. AF point selection has been improved as well. Photographers can select their own point through either the camera's Multi-controller or Main Dial/Quick Control Dial. Automatic selection is as simple as the press of a button. With Custom functions, photographers can select their own default focus point to automatically switch between horizontal and vertical shooting and can even choose to have primary focus supported by adjacent focus points for more accuracy with moving subjects. The EOS-1D Mark IV features a standard ISO range from 100 - 12800 with an expanded range of 50 to 102400. The combined noise reduction capabilities of the Dual DIGIC 4 Image Processors and Canon CMOS sensor help ensure that even at an ISO setting of 102400, noise is kept to a minimum. This greatly expanded capability provides an increased range of real-world shooting options, especially in available-light or dim situations. A low ISO speed can be useful, for example, when shooting high contrast scenes at large apertures. Blown highlights, such as the shading of a bride's dress, can be avoided and photographers can use wider apertures to control depth-of-field in ways not possible at higher ISO settings. Additionally, the EOS-1D Mark IV features the Auto Lighting Optimizer (ALO), which automatically adjusts the brightness and contrast during image processing to minimize the need for expensive and time-consuming post-production processing. Auto Lighting Optimizer is available in most shooting modes, including Manual mode and can be applied to RAW images using the included Canon Digital Photo Professional software. The EOS-1D Mark IV captures video with all the benefits of shooting with an EOS digital SLR. 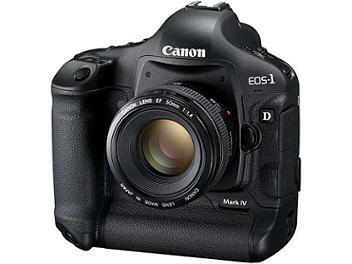 The HD recording area on the EOS-1D Mark IV is approx. 27.9 x 15.7mm, similar when compared to the 24.89 x 18.65mm recording area of Super 35 motion picture film. By shooting video with a large sensor camera, photographers as well as videographers can take advantage of the creative features native to SLR photography. Along with its manual controls, the EOS-1D Mark IV allows for full use of Canon EF lenses, including wide angle, macro, super-telephoto, tilt-shift lenses and fisheye, providing a wealth of depth-of-field and other creative shooting options once reserved only for still photography. The resulting HD video is a standout in its stunning depth-of-field characteristics, remarkable capture capability under poor lighting conditions with its vast ISO range, and deep clean blacks with nearly undetectable noise. When shooting HD video in AE modes, the EOS-1D Mark IV employs Center Weighted average metering to help ensure stable motion-picture exposure with the camera automatically selecting the ISO speed, shutter and aperture. Full manual exposure control is also available while shooting video when the camera is set to Manual mode. Video can be captured at 1920 x 1080 resolution at frame rates of 24 (23.976), 25 or 30 (29.97) frames per second, for up to 4GB per clip. Movies are saved as MOV files and can be viewed in Full HD with HDMI output. Other recording sizes include HD at 1280 x 720 (50/60 (59.94) fps) or SD/VGA at 640 x 480 (50/60 (59.94) fps). The EOS-1D Mark IV has a built-in microphone for simple mono recording and stereo sound can be recorded through a self-powered external microphone. The EOS-1D Mark IV features a high-resolution APS-H sized 16.1 Megapixel CMOS sensor (with a focal length multiplier effect of 1.3x) and Dual DIGIC 4 Image Processors that can process images at full resolution continuously up to 10 frames-per-second. The combination of the CMOS sensor and Dual DIGIC 4 Image Processors help to ensure smooth, detailed and refined images that are recorded quickly, accurately and reliably. This impressive combination of speed, quality and performance will make the EOS-1D Mark IV a staple among many professional photographers, including sports photographers, and a familiar sight on the sidelines of professional sporting events. The EOS-1D Mark IV's rugged, high-speed shutter can shoot up to 10.0 frames per second (fps) for up to 28 consecutive RAW files or 121 full-resolution JPEGs when used in conjunction with UDMA (Ultra Direct Memory Access) Mode 6 CF cards. The EOS-1D Mark IV's spectacular new 45-point high-speed AF sensor locks on and maintains focus, ensuring that the camera keeps up with its amazing shutter. The EOS-1D Mark IV features a new, high-resolution, 3.0" ClearView II VGA LCD. The screen boasts 920,000 dot resolution and provides a new level of clarity and sharpness with a 160o angle of view. Its performance is admirable, not only in confirming focus and composition, but in composing and shooting in Live View mode, or when shooting video. It features a tempered glass protective cover with an anti-reflective film and a new resin filling between the actual LCD and glass cover that helps minimize internal reflections and further improves visibility in bright viewing situations. During image playback, pressing the illumination button displays an LCD brightness screen, so brightness can be adjusted quickly and easily. A lightweight and incredibly strong magnesium alloy construction helps the EOS-1D Mark IV to endure almost any condition, and the EOS-1D Mark IV features a shutter designed to shoot 300,000 cycles. All the EOS-1D Mark IV's controls, buttons and external covers are dust- and water-resistant, ensuring uninterrupted operation whether shooting in the rain, in a windstorm and everything in between. Dust is managed with the advanced Canon EOS Integrated Cleaning System, which helps to suppress dust generation, removes existing dust and uses the combination of Dust Delete Data and DPP software to eliminate any remaining dust spots on your images. When the EOS-1D Mark IV is used with a dust and water-resistant EF lens or external Speedlite, the entire camera system is nearly impervious to the elements. The EOS-1D Mark IV is compatible with all Canon lenses in the EF lineup (excluding EF-S lenses), ranging from ultra-wide angle to super telephoto lenses. Canon lenses employ advanced optical expertise and micron-precision engineering to deliver outstanding performance in nearly all facets of the photographic process. Special optical technologies, such as aspherical optics and fluorite elements, are featured in the widely acclaimed L-Series lenses, and Canon Image Stabilizer technology in select lenses helps to minimize the effect of camera shake. Through Canon lenses, photographers can truly maximize the quality and liberating performance of the 1D Mark IV.